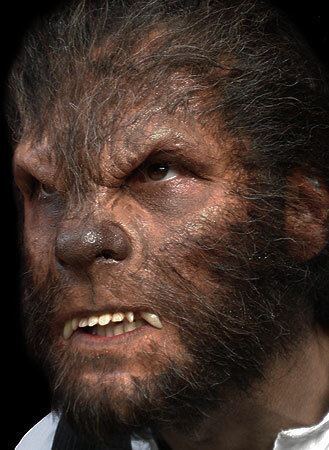 A highly detailed werewolf prosthetic – become the wolfman with this Halloween make up, a classic for horror costumes! 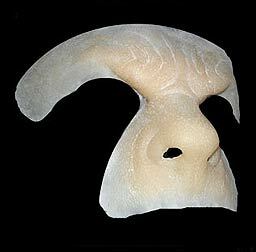 For an ideal application of this piece, we recommend using our Large Prosthetic Application Kit. If you are using this prosthetic in warm conditions or wearing it for a day long film or photo shoot, you may want to try our NimbaFix Silicone Prosthetic Adhesive for an even stronger hold. 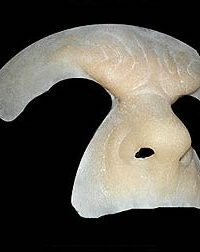 This prosthetic is cast in professional grade gelatine with micro fine edges that can be blended away with our Gelatine Blender. If you are looking for a reusable prosthetic, try our Silicone Werewolf Appliance cast in durable, flexible, latex-free rubber that can last multiple applications. Watch the video below for complete instructions on how to apply this prosthetic and learn how to add hair to the appliance for maximum effect. You can also find an easy to follow general application guide in this blog post. I loved the way this werewolf prosthetic turned out for me this past halloween awesome stuff. I loved this prosthetic, when I applied it for a con, it worked out fantastically. I have to say, nimba creations has some talented people. Having never used a gelatin prosthetic before I was very suprised at how good this piece was. Awesome product from 1st class company. This prosthetic worked great as an orc. It does not come with hair attached so it can be used in a variety of ways. Again this was super comfortable. Probably the best prosthetic appliance I have ever worn. It’s incredible to see all the details on the proteshtic. You made a great job. This prosthetic was superb! Easy to apply, looked great. There was a slight overhang over my bottom lip and the nose was stretched slightly because my nose was a tiny bit too big, but with a bit of adjustment whilst the adhesive was drying, it worked out fine. I’d definitely recommend!